That’s right! Today we’re eating Parmesan Soup. And unless you’ve been to Paris and dined at Stéphane Jégo’s L’Ami Jean restaurant, there is a minimal chance that you’ve tried anything like this before. In fact, before I came up with a title for this post, I had to do some digging into Google and Pinterest. 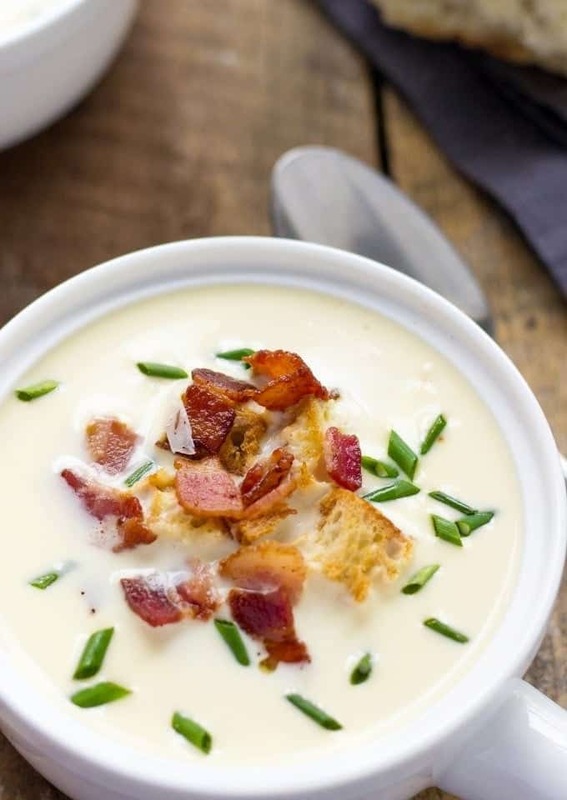 I searched for other Parmesan Soup recipes, to see how bloggers are titling them. 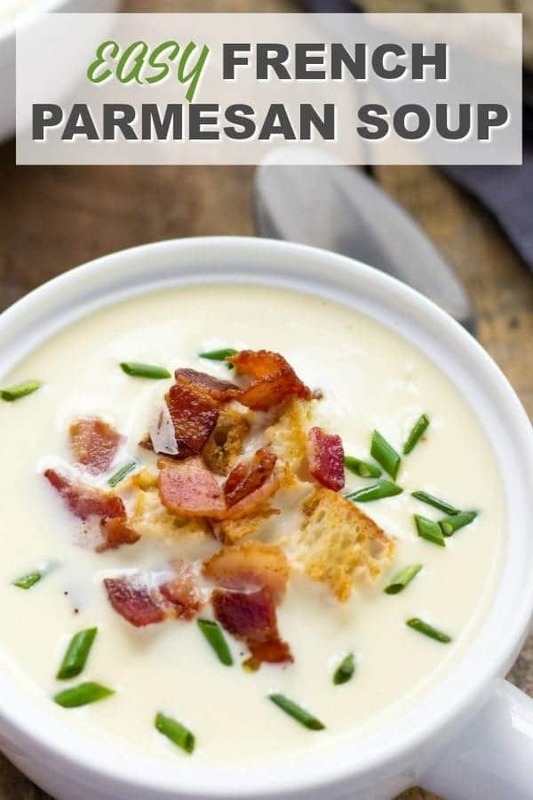 I haven’t found any single recipe where Parmesan would be a star of the soup. I guess, this is only to my advantage, because now you know a source for the most delicious homemade Parmesan Soup ever. I was inspired to make this super delicious Parmesan Soup after exploring my favorite cookbook by Mimi Thorisson “A Kitchen In France”. You remember, that I’m pretty obsessed with this book and made quite a few recipes from it. 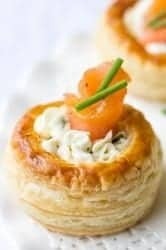 Remember Smoked Salmon And Cream Cheese Vol Au Vents that I made a few weeks ago? Those are scrumptious. According to Mimi, original Parmesan soup recipe belongs to Stéphane Jégo’s, chef of Parisian L’Ami Jean restaurant. In his recipe, he uses a combination of milk, broth and heavy cream as a liquid base for the soup. I wanted to make my soup a little bit on the lighter side so I substituted half and half for the heavy cream. A few notes on cheese. I advice you to buy Parmigiano-Reggiano and not Parmesan that you can find in most grocery stores. Parmigiano-Reggiano is slightly more expensive but it has so much more flavor and since the soup is based on cheese, go for the real deal. This soup is quite filling and I advice you to serve it rather as a starter, not the main dish. It’s extremely flavorful! Just one spoon of the soup and you’ll be hooked. So when the times comes to eating, I won’t blame you if you ladle yourself some more. In fact, that’s what I did on the night that I made that soup. It was so good! 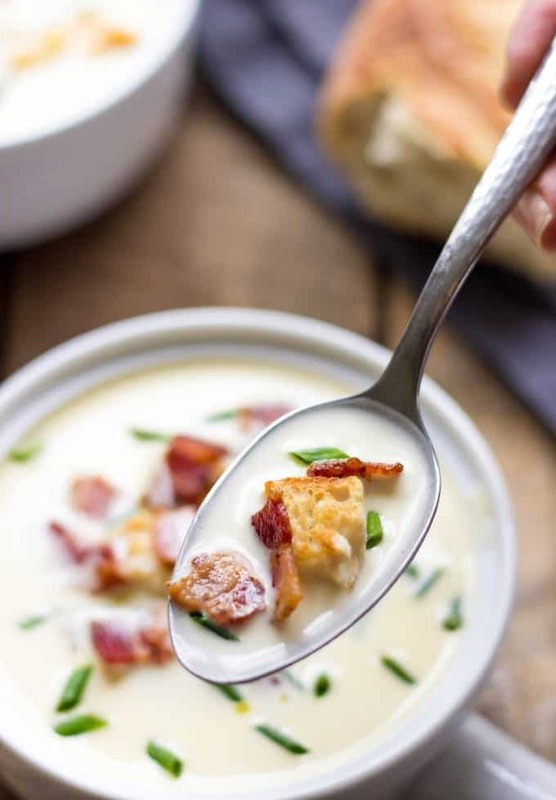 The addition of crispy bacon and garlicky croutons make it irresistible and perfect comfort food for cold winter nights. 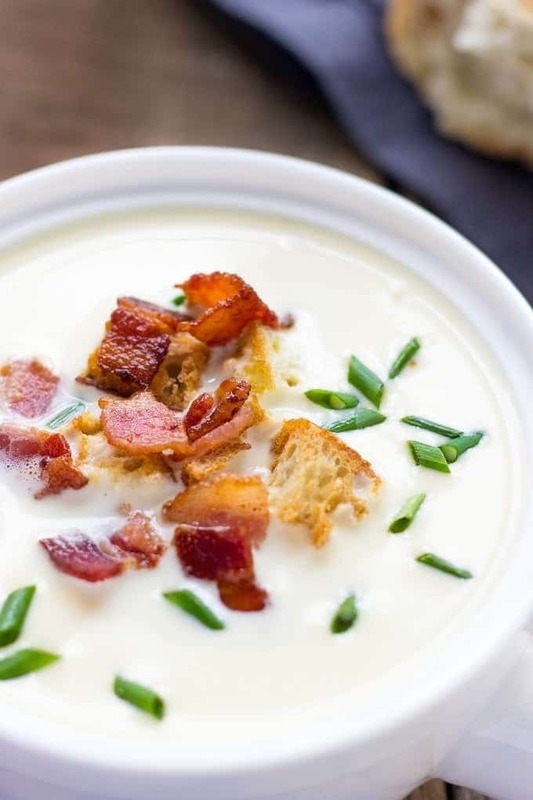 So, on those days, when you feel like preparing something special and easy for your family, give French Parmesan Soup a try and let me know how you liked it. Melt butter in a medium pot and over medium heat. Add shallot and cook stirring occasionally until translucent, about 10 minutes. Add ¾ of Parmigiano Reggiano, chicken broth, milk and half and half. Reduce the heat to low, season with salt and pepper and simmer the soup for 45 minutes, until all ingredients are melted. Meanwhile, heat a medium skillet and over medium heat. Add bacon and cook until bacon is crispy. Transfer to a paper towel. After 45 minutes, add the remaining Parmigiano Reggiano into the soup and simmer for another 10 minutes. Using a stand blender, purée the soup and strain through a sieve. Serve immediately with crispy bacon, garlicky croutons and sprinkling of chives. Heat the olive oil in a small sauce pan and over medium heat. Add garlic and cook for 1 minute until garlic releases its aroma. Strain the olive oil and discard garlic. Spread baguette cubes on a parchment lined baking dish. Drizzle with garlic-infused olive oil and toss well. Bake for 10-15 minutes until croutons are crisp and slightly browned. Recipe is adapted from Mimi Thorisson's "A Kitchen In France"
If you make this recipe, don’t forget to snap a photo and post it on Instagram with a hashtag #lavenderandmacarons. Hi. I’m making this for dinner tomorrow and I’m curious if I make it and leave it to sit on a warm burner for an hour if it’ll separate (also sauce does that)? I’m also following a keto diet, so I need the fat and would like to use heavy whipping cream instead of half and half (as you stated the original recipe contained) . Would it be the same measurements? And since milk is higher on carbs, did the original recipe call for milk? Should I do more broth with the HWC instead? This sound AMAZING, and I would love to figure this out using more fat so I can tell all my keto friends about your recipe. Thank you. The soup shouldn’t separate if you leave on a warm burner for an hour. Soups with high fat content don’t curdle as easy.